Here is a summary of my piano rebuilding manual. 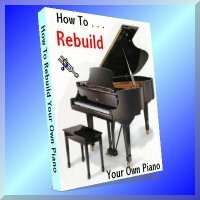 "How To Rebuild Your Own Piano". This chapter deals with the very important steps required for taking your piano apart in preparation for piano rebuilding. I have included a special chapter on taking a Grand Piano apart. In this chapter you will learn to record all the vital information about the design of the piano that you will need for ordering parts and installing them correctly -- very important! This can be a difficult job or an easy job if you do it right. Discover the easy way in this chapter. You want to order the right parts the first time. Avoid costly mistakes with the detailed guidance I provide here. It pays to do it right the first time. Do you have a cracked soundboard? Don't despair! You can save your piano with my special instructions in this chapter. Re-stringing can be a pleasure or a nightmare. I want you to enjoy your work and get the best results. Find all the information you need right here. Replace chipped ivories or recover the entire keyboard. It will be a pleasure playing your piano again! What do all those moving parts do? Discover the answer here. You will be surprised how nicely your piano plays again -- just like new! Here you can get it all together, with no parts left over. You need to do a first class job here to bring out the best tone in your piano. Make your piano sing again. New felt will give your keyboard a nice touch. You will be amazed how well it plays. All the moving parts must travel the correct distance and move at the right time. A good regulation job will give the action maximum performance. Regulating a grand action is a much more involved procedure. You will have step by step instructions to do a super job. "How To Tune Your Own Piano". Note: I have included a special section in my piano rebuilding manual on replacing a pin block in a grand or upright piano. This delicate operation is crucial to the quality of the entire piano rebuilding work. Get complete instructions in this very special document. Note: If you are rebuilding a square grand, you will find special instructions to assist you in your project. Click here for more information on piano rebuilding.